Here is a list of movies I have in my movies on DVD I have that I haven't watched yet. As always if there is any you would like to see a review for let me know... I won't promise to get to it this weekend... but I will try. Funny... I had a feeling both those requests would come up! and Amped maybe since I want to know if it's a good movie. I decided to start my marathon with a classic. One of the Val Lewton movies I bought this past October. After watching the movie I am a little disappointed that it has nothing to do with ghosts... but it is a good movie. It has some great atmosphere in it. I found that when we heard the mute sailor's thoughts it was quite eerie. It was well done. While I did enjoy this movie quite a bit... I must say that so far it is my least favorite of the Val Lewton movies that I have watched. After watching the movie I am a little disappointed that it has nothing to do with ghosts... but it is a good movie. It has some great atmosphere in it. I found that when we heard the mute sailor's thoughts it was quite eerie. It was well done. While I did enjoy this movie quite a bit... I must say that so far it is my least favorite of the Val Lewton movies that I have watched. Sounds like we're still in sync with this series, Pete! I also found Ghost Ship the weakest. The director also did Isle of the Dead, which on first viewing I thought one of the weaker entries too, so it may be down to him (he did 7th Victim too). Not that I like self-promotion, but it might be worth you scanning my reviews of the series for the remaining entries because while I think Isle of the Dead, Bedlam and especially I Walked With A Zombie are all better than Ghost Ship, they can also be misleading titles... like Ghost Ship not having the sort of ghosts you might expect! I really have no idea what that last shot was all about. But you know... I really didn't pay to much attention to it at the time. But now that you mention it... it was a bit weird. A volcanic eruption in the North Atlantic brings to the surface a 65-foot prehistoric monster. Two treasure divers capture the creature and take him to London where he is put on display in a circus. A scientist is thoughtful enough to point out that the sailors' bonanza is only an infact and that a full grown specimen would be over 200 feet in height. Sure enough, Gorgo's mama comes thundering ashore, reclaims her offspring and heads back to sea — but not before she trashes a generous portion of London. 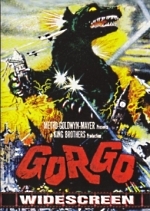 The special effects in GORGO, provideed by Tom Howard — two time Academy award winner, are truly admirable. The monster is quite ferocious — except when he wiggles his ears. This is one of the movies that our friend Roger sent me. I thought I would watch (at least) one of the ones he sent me this weekend as well. This is really not the type of movie I normally watch... but I was able to enjoy it. Both the story and the effects is like a cross between Godzilla and King Kong. One thing I found rather odd is there was no main female character in this movie. More or less you seen some women running around in the streets in crowds and such... but other then that... pretty much all male actors. The quality of the print while more then watchable... could have been better. But considering this movie is almost 50 years old... I really can't complain too much about that. Since (at least at this point) I really don't feel up to a 2 and a half hour movie... I will review your second choice next. But keep in mind my feelings about music. So you should take that into account when you read my review. And yes... I was able to guess your first choice before peeking. That's a point! What do you think of Sir Lancelot? He pops up occasionally in the Lewton movies, most recently for you in Ghost Ship, but he was the butler in Curse of the Cat People too. He has a tendency to sing though! I was pretty much sure that was the point! As for the guy in Curse of the Cat People and The Ghost ship... he was easy to ignore. I barely even noticed it last night when I watched The Ghost Ship! You owe me for this one Jimmy! The new lead singer of the female fronted rock band, the "Danger Dolls", is found dead of an apparent cocaine overdose. But detective Holden begins to question the circumstances surrounding her death. Not being into music of any kind... this is not normally my type of a movie... but I am review this one at the request of a friend. This movie is from the Mortuary of Madness boxset I got this past October. Like many of the movies in this set... the acting leaves much to be desired. But I have seen worse acting in other movies in this set. Now I can normally just ignore music in a movie... but in this case... the singing was bad. And it is much harder to ignore bad singing then it is to ignore the music of real musicians. This woman's voice just goes through me and hurts my ears. At one point I actually had to fast forward through a song that played while showing some clips. Which is something I can normally ignore... but not with this movie... not with this singer. It also seemed the camera man liked to get a bit on the creative side. using some unneeded close-ups, over the shoulder shots and the like. Then there was the mixture of color and Black and White. (B&W for the flashbacks). I found the story to be slow. The movie was only an hour and 11 minutes... and it just seemed to go on and on. It just really wasn't that interesting. I just wasn't too impressed with this movie. I'm quite surprise that you had decided to watch this one, since it was to make you watch Alucard. At least now I know it's bad and if you say that the song are worst than usual it's a good hint to not watch (I suppose that most of the songs sound like very cheap copy of Veruca Salt or The Go-Go's). At least 2 of the girls on the cover are cute it's a positive if this is true. I think I owe you one, just try to be not too rough when you will decide to reclaim this debt. What you know... the mood hit. Expect a review for Alucard next. This is another movie from the Mortuary of Madness box set I got this past October. I went into this one with caution.... for two reasons. First it is in a box set of very low budget movies. Second it is a low budget film that is 2hrs. 30min. long! And that is a long time to sit through a low budget horror film. The picture quality of this movie is surprisingly good for such a cheap low budget boxset. As is the Audio. The story is interesting... but SLOW! Unfortunately every time it started to get good they decided to change the subject... going to another diary and such. I think the main thing that goes against this movie is the length. And the fact that they seemed to want to concentrate more on the dramatic story telling over the horror of the story.Which after a while got tiresome. So once again... I think the length of this movie is what hurt this movie more then anything else. They could have easily cut this movie in half... and we would have had a right good low budget modern telling of the story.